Pretty room with Far-East theme. Double bed + en-suite bathroom with shower. TV with DSTV decoder, desk, air-conditioner. Equipped with fridge, kettle and microwave. Light, airy room with Beach theme. King size bed for couples or 2 single beds. En-suite bathroom with shower. TV with DSTV decoder, desk, air-conditioner. Equipped kitchenette with sink unit, microwave, fridge, kettle, toaster, cutlery & crockery etc. Gorgeous room with Moroccan theme. This double bedroom has a double bed, en-suite bathroom, desk, TV with DSTV, air-conditioner and kitchenette: fridge, m/wave, kettle, toaster and tea/coffee facilities etc. Extra large, airy, upstairs bedroom with king size bed (or TWIN beds), en-suite bathroom, lounge area with large flat screen TV/DSTV decoder, desk and 2 extra single beds. Equipped kitchenette with dining table. Private balcony with beautiful ocean views. A studio bedroom. 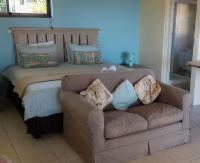 Extra large, airy room with king size bed, sitting area with flat screen TV+DSTV, full en-suite bathroom (bath+shower) & large, equipped kitchenette with breakfast bar, dining table, sink unit, microwave, fridge, kettle etc. Studio with king size bed (or 2 single beds) and sitting area with flat screen TV+DSTV decoder, en-suite bathroom, dining table, desk & large, equipped kitchenette with sink unit, microwave, fridge, kettle etc. Extra daybed for third adult or child. Large Family room with enclosed balcony and ocean view. 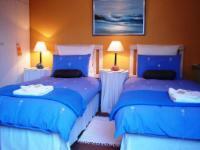 Beds can be set up as King and single or 3 single beds. All refunds are at the discretion of management & are dependent on ability to re-let rooms reserved; & will incur a 15% admin fee.